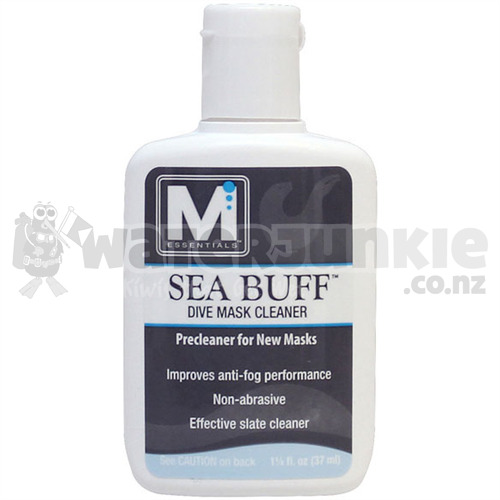 Sea Buff Dive Mask Pre-Cleaner is specially formulated dive mask pre-cleaner and slate cleaner. Sea Buff carefully removes silicone residue left on new dive mask lenses by the manufacturing process and prepares the surface for the first application of Sea Drops or Sea Gold Anti-Fog Formulas (see SKU's: MCNASAF and MCNSG2). Failure to use a pre-cleaner on a new mask will not allow mask de-fogging solutions to properly keep a mask clear of fogging when diving. Sea Buff also removes other residue accumulated on masks while diving or during storage. Plus, the lens cleaner in Sea Buff takes care of dirt, sunscreens, algae and other debris that can interfere with anti-fog treatments. Just apply rub, rinse and repeat. Sea Buff is also ideal for cleaning dive communication slates without harming or scratching the slate.